Bertram N. Brockhouse was a condensed matter physicist at McMaster University. He developed methods for investigating different materials with beam of neutrons in a nuclear reactor. He was awarded the 1994 Nobel Prize in Physics "for the development of neutron spectroscopy." July 15, 1918Birth, Alberta (Canada). 1939 – 1945Radio Telegrapher, Royal Canadian Navy. 1947Obtained BA in Physics and Mathematics, University of British Columbia, Vancouver (B.C.). 1948Obtained MA in Physics and Mathematics, University of Toronto, Toronto (Ont.). 1949 – 1950Lecturer of Physics, University of Toronto, Toronto (Ont.). 1950Obtained PhD in Physics and Mathematics, University of Toronto, Toronto (Ont.). 1950 – 1962Researcher, Chalk River Nuclear Laboratory, Ontario (Canada). 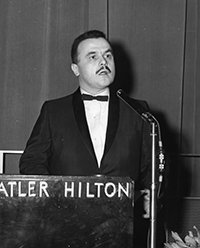 1962Fellow, Royal Society of Canada. 1962Awarded Oliver E. Buckley Award, American Physical Society. 1962 – 1984Professor of Physics, McMaster University, Ontario (Canada). 1963Awarded Physics Society Award UK. 1963Awarded Institute of Physics Award. 1967Awarded Gold Medal, Canadian Association of Physicists. 1969Awarded honorary doctorate, University of Waterloo. 1982 – 1995Officer (1982-1995) and Companion (1995), Order of Canada. 1984Awarded honorary doctorate, McMaster University. 1994Awarded Nobel Prize in Physics "for the development of neutron spectroscopy". October 13, 2003Death, Ontario (Canada). Instrumentation and condensed matter physicist. Advised by Brockhouse at McMaster University. PhD advisor at University of Toronto. Both won Nobel Prizes in Physics in 1994 for separate projects. Professor of Physics. Awarded honorary doctorate. Obtained MA in Physics (1948) and PhD in Physics (1950). Lecturer in Physics. Awarded 1962 Oliver E. Buckley Award. Obtained MA in Mathematics (1948) and PhD in Mathematics (1950). B. N. Brockhouse papers, 1947-2003. Phonons and phonon interactions/ B.N. Brockhouse [and others] Thor A. Bak, editor. Nobel Prize Bertram N. Brockhouse biography.